Yesterday someone asked what color I paint my mirrors so I thought I would repost my process. I've used different shades of white spray paint as the base color because I didn't want them to look all the same. I wanted it to look like I collected different white mirrors over time, not like I bought gold mirrors and sprayed them all the same. First take the mirror out of the frame. Usually there are little metal things that you can just bend up and the mirror will come out. Be careful the edges of the mirror are usually sharp! First paint the back of the frame. You may think that this isn't important, but it is. 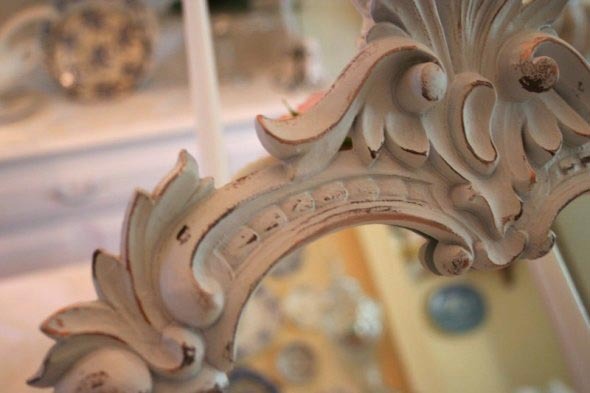 If you don't paint the rim area where the mirror sits you will see the old color through the reflection in the mirror...I learned this the hard way! . Let it dry and then turn it over. It dries really fast! Now spray the front and let that dry. Now comes the fun part. 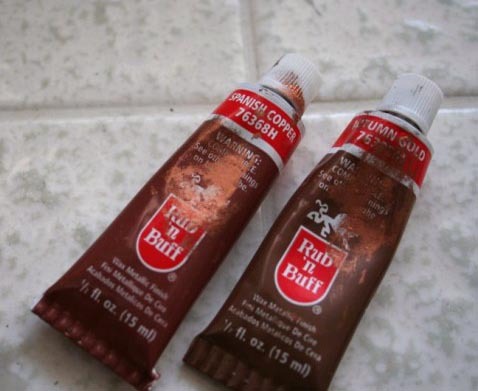 I use Rub 'n Buff which you can buy at most hobby shops. It comes in a lot of different colors. I used a combination of Spanish Copper and Autumn Gold for this mirror. Put a VERY small amount of Rub 'n Buff on the very tip of your index finger and lightly rub over some of the high edges of your mirror. 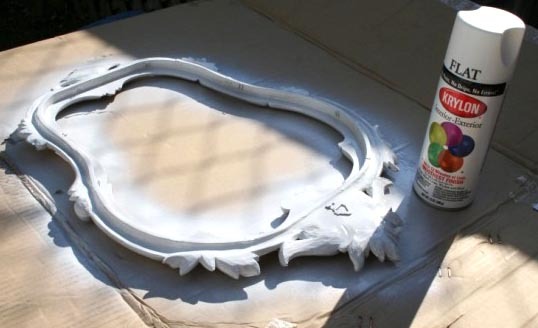 You are adding paint but you are creating the effect of paint that has worn off so put it in places where paint would naturally wear off over time. A little of this paint goes a long way. You may want to practice on something else before you use this so you get the feel of it. Put the mirror back in and you're finished! Love your mirrors. Thanks for showing how to give them a new look. I love Rub and Buff! I've spruced up several things in my home with this wonderful paste. Can't wait for Friday's "Show and Tell". Well that was just way too easy! I think we should all be doing that with our old gold mirrors. Your mirrors are lovely and the technique that you use is great. LOL - I think you mean paint the back of the frame, not paint the back of the mirror. I learned that with the first mirror frame I painted. Took me a while to figure it out. . .you can't just tape off the mirror. Your mirrors look great on your stair wall. Thanks for sharing. 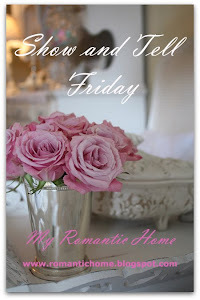 I read and enjoy you blog every day. Beautiful look! 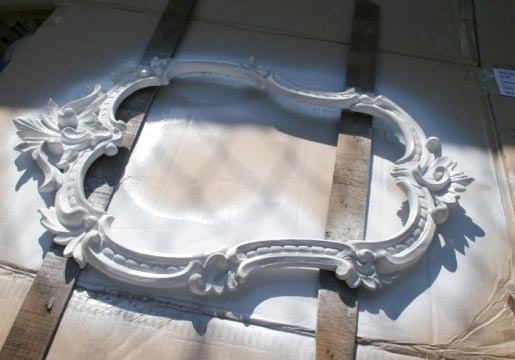 What an amazing change for plastic formed mirrors; they look just gorgeous with their new old-look white paint jobs. I have some frames I'm going to give this treatment to, as soon as it's no longer 100-degrees outside and too hot to paint! That is a very clever way to make them look so special; great job done! Thanks for sharing this. Absolutely love this idea!! Thank you so much for sharing! I love them all cascading along your new staircase! Lovely!!! Thank you so much for sharing your painting technique. I didn't know about Rub n' buff so that was VERY helpful! Love this, Cindy! I do love the wonderfully detailed frames you seem to find. Thanks so much for sharing the details on how to get that look...I think I can actually give it a go! I have this post saved in my favorite places for when I paint mirrors. I had never thought of painting the back but after your advice I make sure to always do so!!! I haven't tried rub and buff yet but am going to have my first go at it on a mirror I got at Big Lots for $7.50. Thank you for re-posting this Cindy!!! I just bought 4 fantastic mirrors this week at yard sales. looking forward to decorating with them. Yours look great, thanks for the inspiration. Thanks Cindy for answering my questions about the mirrors! Love the new hair cut too!! Happy Summer! UhOh - rub n buff is a new product to me. Look out stuff : ). Your tutorial was excellent. especially the tip about the inside of the mirror. after you redid them. They all have a totally different look. 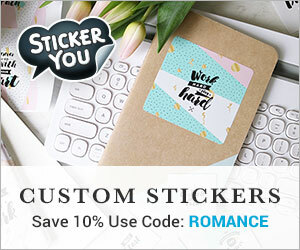 Wow--that is a fabulous idea! 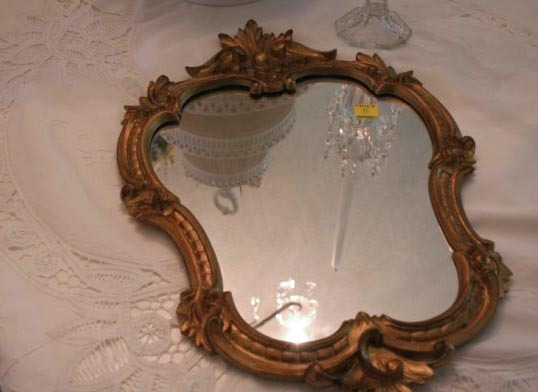 I want to kick myself for leaving a gorgeous mirror like that that I saw a thrift store last week. Well--now I will know better! Beautiful work! 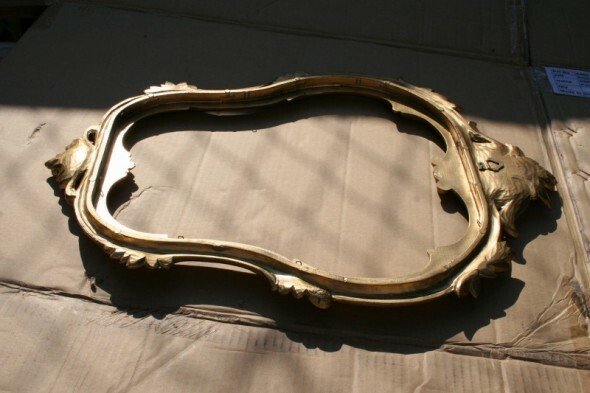 Cindy--I think that might be the answer to all the gold frames I have now that are just too ritzy to go with our country home now. This would be a great process to renovate them. Couldn't you do colored frames and use something that leaves a 'white' edge to antique it? Is there such a thing as white rub and buff? 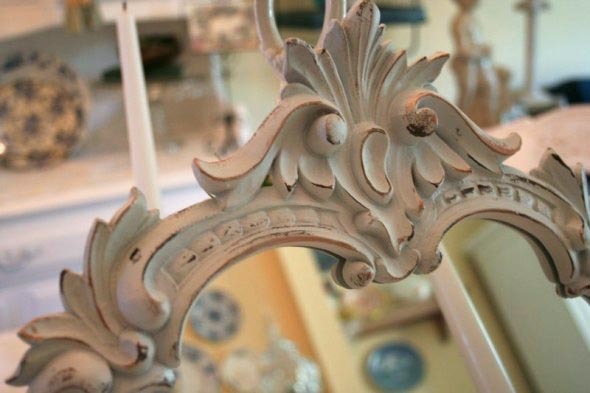 You have some fabulous mirrors gracing your stairway wall! I'll have to give your technique a try, love the effect it gives to the frame. Thank you Cindy for the tutorial. I never knew about the rub and buff!! Great tutorial, Cindy. I have always wondered how to use Rub and Buff! Cindy, Thanks for sharing this. Your wall of mirrors is fantastic. 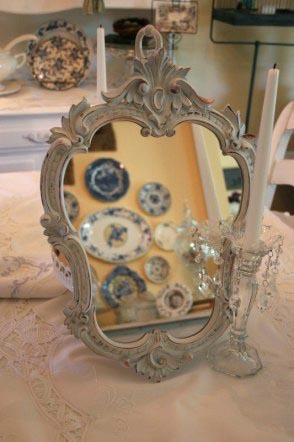 I'm always on the search for mirrors with pretty frames. I've painted many mirrors but I'm going to use Rub and Buff on the next one. I have one that looks almost exactly like the one you show. Thanks for advice! Wow! So simple! Thank you Cindy for the quick tutorial. 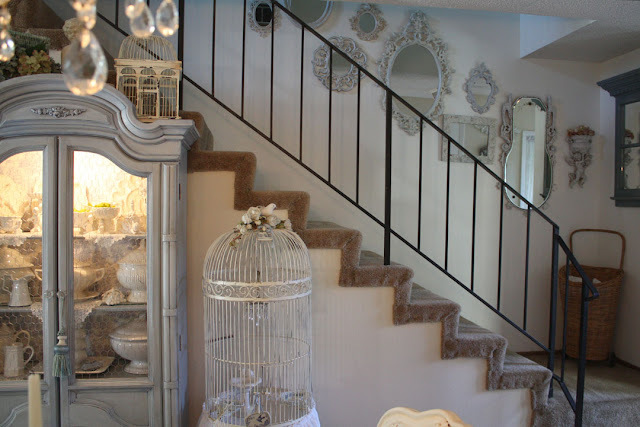 Lovely.. Lovely stair case... Love how you've displayed the mirrors.. and the cage.. wow! I love rubb n buff! They sell out of all the best colors at my craft store so fast though. Enjoy your weekend! Thanks so much for using AMACO's Rub 'n Buff and sharing this great tutorial with your readers! Your mirrors look wonderful. That mirror came out beautiful!! I love that technique, thanks for sharing!! such a simple process...and yet the finished result is truly awesome!! Thanks for sharing your secrets! I enjoyed this post so much. I spray paint mine too, but had never thought of using Rub and Buff! I have got to try this! I LOVE your hair Cindy...WAAAY cute!